The first of the tomatoes from the garden are coming along slowly – but this week we had a good double-handful of small cherry tomatoes, in all colors; the usual red, but some lemon-yellow ones, and some of them so-called ‘black’ which were actually a kind of pale purple. Having a couple of ears of fresh corn in the refrigerator, I decided to make a summer corn and tomato relish out of them. This recipe was pulled from Cuisine at Home, issue #52, August 2005. Whisk together ¼ cup cider vinegar and 1 TBsp sugar, until sugar is dissolved. 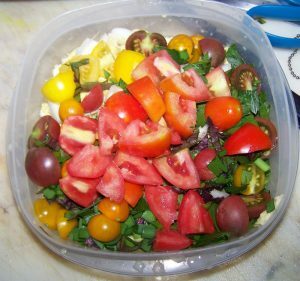 Combine with 2 cups grape or cherry tomatoes, 1 cup of fresh corn kernels, (From two ears of corn), ½ cup thinly sliced red onion, 2 TBsp. chopped fresh flat-leafed parsley, and 1 TBsp. each chopped fresh chives and thinly-sliced fresh basil, with a sprinkle of freshly ground pepper and salt to taste. Cover and chill until serve. This recipe can be reduced by half, for a smaller number of people. With the corn and tomato salad, we duplicated the cheese and spinach stuffed Portabella mushrooms that our local HEB has on hand, only using sorrel leaves instead of spinach. My daughter says that the sorrel, cooked, has more substance and flavor than spinach. Take two (or as many as you need, allowing one per person) Portabella mushrooms, at least five inches across. Slice off the stem, level with the underside of the mushroom, and gently wipe the mushroom cap clean. Lightly brush the cap with olive oil, and place in a baking dish, stem side up. Sprinkle the mushroom underside with a light dusting of adobo seasoning, and layer each mushroom with fresh spinach leaves, or sorrel leaves, torn in half to fit and making two or three layers of leaves. Pile each with about 1/3 to ½ cup grated mozzarella cheese, and a little crumbled dry thyme. Bake at 350° for twenty minutes or so, until the cheese is deliciously melted and runny, and the mushrooms are done. We topped off this supper with a focaccia bread loaf, made from dough left over from a recipe in a book called Rustic European Breads From Your Bread Machine. The recipe is a speedy one, French Baguettes For a Crowd – we use about two-thirds of the dough to make a thin-crust pizza, and the rest for a small pan of focaccia. Combine in the bread machine pan: 2 ½ teasp bread machine yeast, 1 ½ cups water (we use whey left from cheese-making, which we store in a jug in the refrigerator) 3 ½ cups bread flour (or the same of regular flour and 1 TBsp vital wheat gluten) and 2 teasp salt. Run through the dough cycle, and allowed to rise at least once or twice. 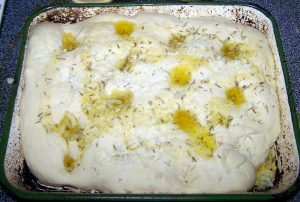 This dough can also be stashed in the refrigerator for a couple of days, until required. Just let it rise again, once removed from the refrigerator. Take that third, and press it out in an 8 x 8 pan greased with olive oil – although I did this loaf in a Japanese enamel pan which measures about 8 x 6. Once risen, then make deep indentations in it with your finger, about every two inches. Slather with a couple of tablespoons of olive oil, sprinkle with salt, 1 teasp of thyme and about 2 TBsp of grated Parmesan. (We used dour own home-made Parmesan.) Bake in a 350° oven – if you are doing the mushrooms, you can bake them together. Dinner delight – guaranteed.